Jake Becraft used the BioXp™ System to build complex DNA fragments needed for his RNA binding study. The Weiss lab at Massachusetts Institute of Technology (MIT) has successfully created a variety of biological circuits involving RNA binding proteins. To investigate the specific binding properties of these RNA binding proteins, graduate student Jake Becraft wanted to create a library of variants. The DNA encoding the proteins Jake studies is complex, containing repetitive regions that make them difficult or expensive to synthesize commercially. Build the DNA variants in the lab using the BioXp™ System. The BioXp™ System successfully built 10 library variants. Following downstream assembly of the fragments with a plasmid backbone and two additional constant regions, Jake obtained all the error-free clones needed to perform his RNA binding studies. Aimee from SGI-DNA sat down with Jake Becraft and asked him to share more about his project and experience operating the BioXp System. Aimee: Can you explain the project you are working on, and how you used the BioXp System? Jake: I’ve used the BioXp System a number of times. For one of my first projects, I used the BioXp System to create a variant library for investigating a type of RNA binding protein. Specifically, I created a small library of variants looking at switching 7 or 8 amino acids at the N and C terminal to investigate the RNA binding properties of the protein. I was able to take the BioXp fragments and place them directly into my cloning platform. Aimee: How did the BioXp System enable your project? 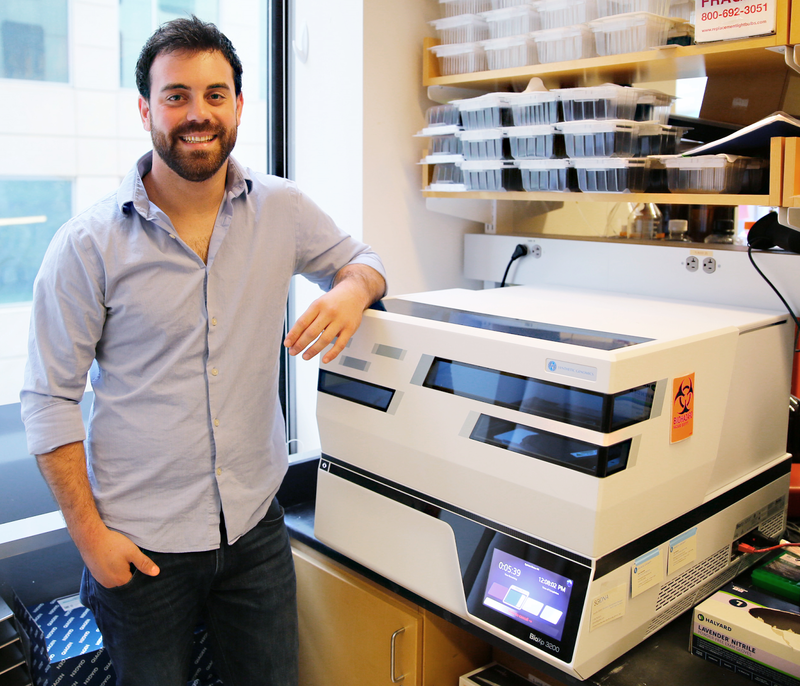 Jake: I used the BioXp to generate DNA fragments that contain repetitive sequences. These fragments were too complex to be synthesized by a routine DNA synthesis service. The BioXp System allows me to build highly complex sequences in a short amount of time, at my benchtop, with high fidelity. It is quick easy to use, and requires little training. The BioXp System also saves money since the BioXp synthesis cost is lower than other synthesis providers. Aimee: How many fragments did you create on the BioXp System? Jake: For the RNA binding protein library project, I generated ten x 1200 bp DNA variants. Aimee: What did you do with the BioXp library variants? Jake: The proteins I study are similar in architecture to transcription activator-like effector nucleases (TALEN proteins), which contain highly conserved domains, including a repeat domain, as well as a variable region. The DNA encoding the domains can be constructed as ~1 kb fragments and assembled using Golden Gate technology. For my project, I collected the BioXp fragments and assembled them with two additional constant regions (~1 kb each) and a Golden Gate destination backbone using a hierarchal MoClo (modular cloning) system to create different modular variants. I picked three or four colonies per construct and was able to find the correct sequence even though the DNA I work with is highly repetitive, difficult to clone, and prone to mutation. Jake Becraft was one of the first people to realize the benefits of the BioXp System and continues to use the instrument for additional studies and areas of inquiry. Stay tuned for more stories from BioXp users like Jake. To learn how the BioXp System can advance your research or additional capabilities, visit sgidna.com/bxp3200 or contact info@sgidna.com.